Are you putting up holiday lights–or did you this past weekend like I did? I hope at the very least you’re using Energy Star-rated holiday lights, which Detroit Edison says uses 75 percent less energy and lasts 10 times longer. That’s a win-win for your spending and energy budget, wouldn’t you say? 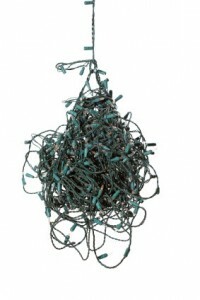 Check for the Underwriters Laboratory (UL) label before stringing lights and setting up other decorations. This label indicates the product has been tested by UL engineers and will tell you if it is safe for outdoor use. Keep lights away from carpeting, furniture and drapes. It takes only one false spark to cause a fire. Turn off decorative lights before you go to bed or leave home. Make sure household smoke detectors are working properly. Use only outdoor extension cords with molded plugs and sockets. Keep all electrical connections off the ground and hang sockets downward to prevent water from seeping into them. Overload electrical circuits (i.e. 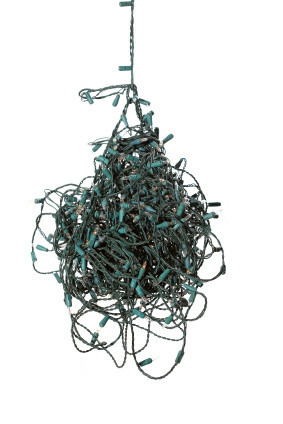 load up extension cords or use more than three sets of standard lights on each extension cord. Insert new bulbs or change fuses when light sets are plugged in. Run electrical cords through door or window openings where they can be damaged. Finally, when decorating the outside of your home and using a ladder, make sure you’ve got someone standing by to help you. I’d hate to have you save some money by doing the decorating yourself but then ending up in the hospital because you fell off a ladder.